Most of the time when people buy a box, it’s because they plan to ship something. But sometimes, a box becomes . . . a playhouse or fort, a bridge, a boat, or a robot. And this month, boxes are Halloween costumes. 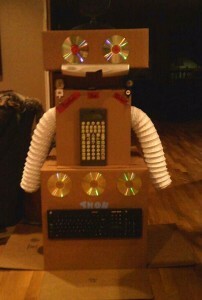 Last week, a customer bought 3 boxes to create Thor, the robot, for her 4-year old nephew. This week, a father brought his son in to be fitted for the proper sized box. His costume? He was going to be . . . a box. (btw, a 14″x14″x48″ turned out to be just the right fit.) We’ve had several Western Washington University students seeking boxes or corrugated to construct a bridge. No matter what the purpose or what your need, we’ve got just the right box for you! No Phone Service at Pak Mail!